Fancy a spot of Crafternoon tea? Auckland's best market. Miss the Aotea markets and other crafty stalls that have disappeared from the city? Then check out Auckland's funkiest craft event, in the upbeat suburb of Kingsland. This isn't your Nana's knitting we're talking about! 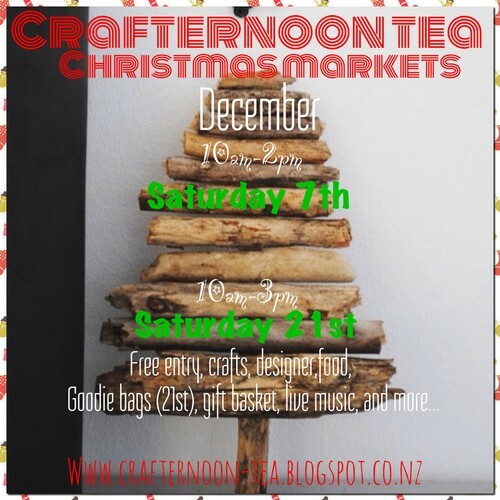 Craft has evolved over the years, and the Crafternoon Tea craft market aims to showcase the diverse range of talented designers and crafters in Auckland. Goodie bags for the first 30 in the door at 10am. Come down and check us out, you'll find jewellery, homeware, children's clothes, artwork, kitchenware, printed t-shirts and hoodies, cupcakes (yum! ), prints, art mounted blocks, photo prints, tea cup bird feeders, bunting, vintage jewellery, upcycled books, bags, handbags, paper goods, softies, live music and much, much more!